Native to South America, beans are widely popular and enjoyed in a variety of dishes. However, they also possess numerous nutritional and medicinal qualities. The common bean was first domesticated as a crop about 7,000 years ago. Today, beans are found in countless varieties and hundreds of cultivars to provide consumers with a variety of health benefits, on and off the table. Enhancing bowel movements. The high fiber in beans gives them laxative properties to help regulate gastrointestinal functions. Controlling blood sugar levels. Beans water-soluble fiber and amino acids are quite effective in aiding regulate glucose, thus helping reduce the risk of contracting diabetes. Additionally, the levels of beta-carotene and other eye nutrients in green beans help prevent macular degeneration, also reducing the risk of eye diseases in general, while red beans have a mild diuretic effect that can help alleviate edema. 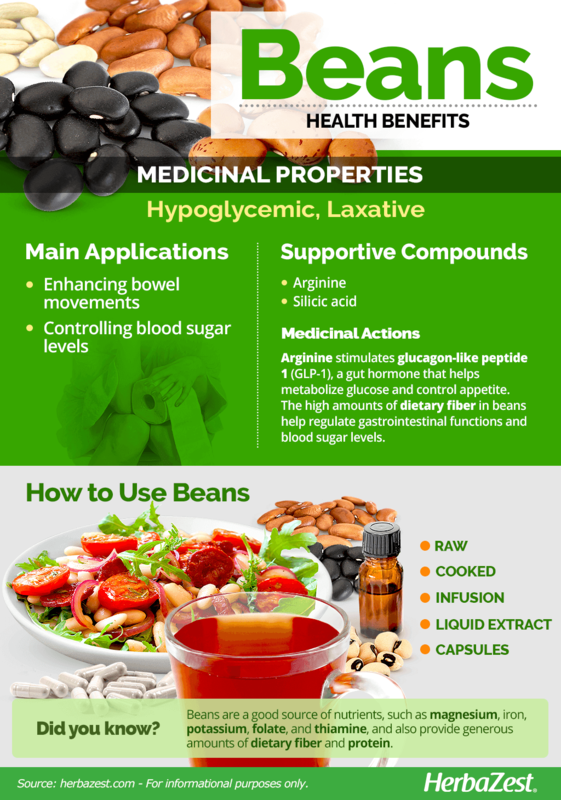 The key components behind the health benefits of beans are arginine and silicic acid. These two active compounds are responsible for the diuretic and anti-diabetic qualities of beans. Arginine works stimulating the gut hormone glucagon-like peptide 1 (GLP-1) to help metabolize glucose and control appetite, thus improving metabolism and aiding with blood sugar management. The silicic acid in beans is a bioavailable form of silicon, the third most abundant trace element in nature, and it has been associated with healthy connective tissue and bone development. It plays an important role in collagen formation and bone mineralization. It has also been linked with an improved cardiovascular health a reduced risk of atherosclerosis. 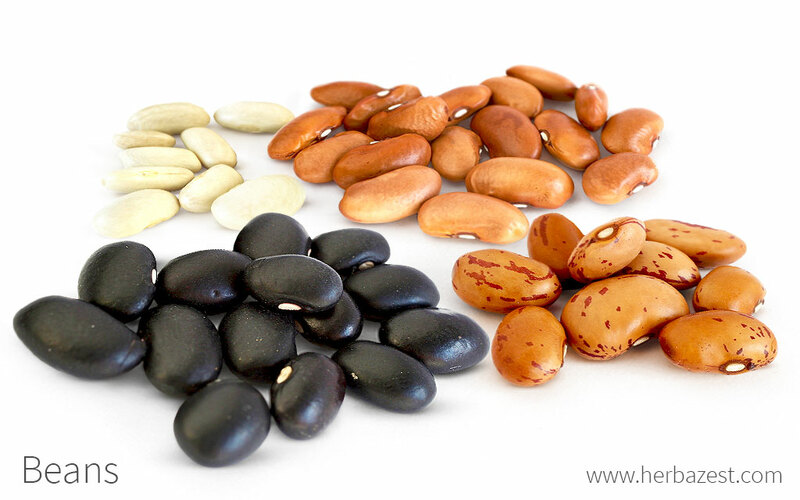 Beans different types of fiber act differently in the body; while water-soluble fiber exerts the most beneficial effect on blood sugar control, insoluble fiber aids with digestive processes, facilitating regular bowel movements. Combined, both types of fiber contribute to slow down digestion and absorption of carbohydrates, preventing drastic rises in blood sugar. They also increase insulin sensitivity, preventing the pancreas to secret this hormone in excess. Moreover, edible-podded green beans are rich in beta-carotene, which is converted into vitamin A (retinol) by the body and is essential for good vision and eye health. They also have a high levels of lutein and zeaxanthin. These eye nutrients filter harsh, high-energy blue wavelengths of light, helping protect and maintain healthy eye cells, which is translated into a reduced risk of chronic eye diseases, such as macular degeneration and cataracts. Because the body cannot naturally produce lutein and zeaxanthin, it's important to obtain them from a well balanced diet. Hypoglycemic properties are also present in basil and mesquite, whereas chicory and psyllium provide similar laxative benefits. Beans can increase flatulence because of their high amounts of oligosaccharides, which are indigestible sugars. However, when paired with digestive aids, beans can be consumed without the intestinal discomfort. Also, because beans are high in dietary fiber, over-consumption may lead to constipation or cramping. It is safest to eat fully cooked or canned kidney beans; however, raw kidney beans contain high concentrations of Phytohaemagglutinin (PHA), which is a toxic lectin that can induce extreme nausea, vomiting, diarrhea, and abdominal pain. Consult a medical professional immediately if experiencing any of these symptoms after consuming possibly undercooked kidney beans. It is most likely safe for everyone to consume beans in normal portion sizes; however, it is not recommended to consume beans in an attempt to cure any ongoing ailments or diseases. 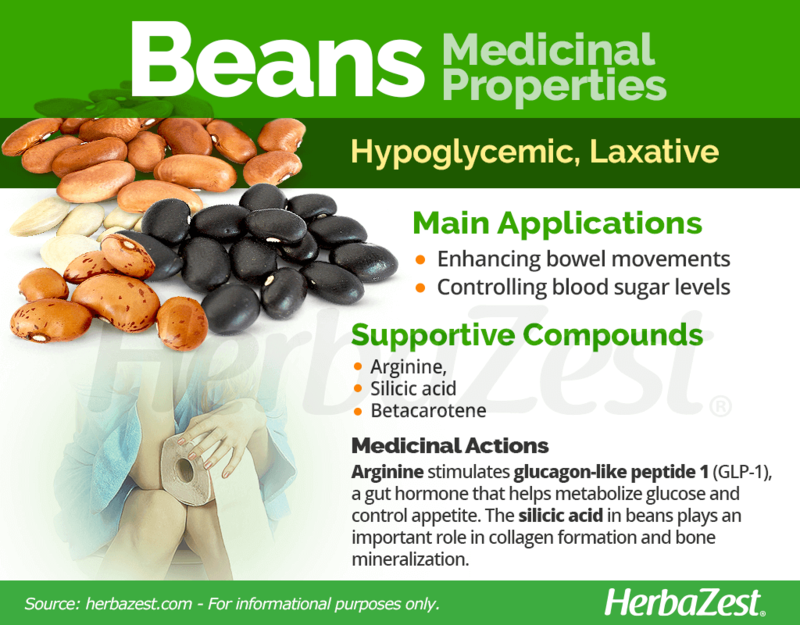 Although there is no research disapproving consumption of beans for a specific group, people suffering from irritable bowel syndrome (IBS) may feel some stomach discomfort, mainly gas and bloating, caused by the high content of oligosaccharides in these legumes. It is recommended to eat beans in moderation, as a part of a balanced diet that includes five daily servings of fruits and vegetables. Always consult with a trusted medical professional before making drastic diet changes or beginning a supplement plan. Beans are an excellent source of vitamin B9 (folate), which is crucial for red blood cells production fetal development, as well as for aiding iron absorption. All type of beans contain high levels of minerals, mainly copper and manganese, both of which are necessary for cellular metabolism, as well as for the well-functioning of nerves and muscles, also contributing to strength bones. Good amounts of plant-based protein can be found in kidney beans, along with vitamin B1 (thiamin) and minerals, such as iron, magnesium, phosphorus, and zinc. Additionally, beans contain fair levels of many other nutrients, mainly vitamins B6 (pyridoxine), K (phylloquinone), and choline, as well as potassium. 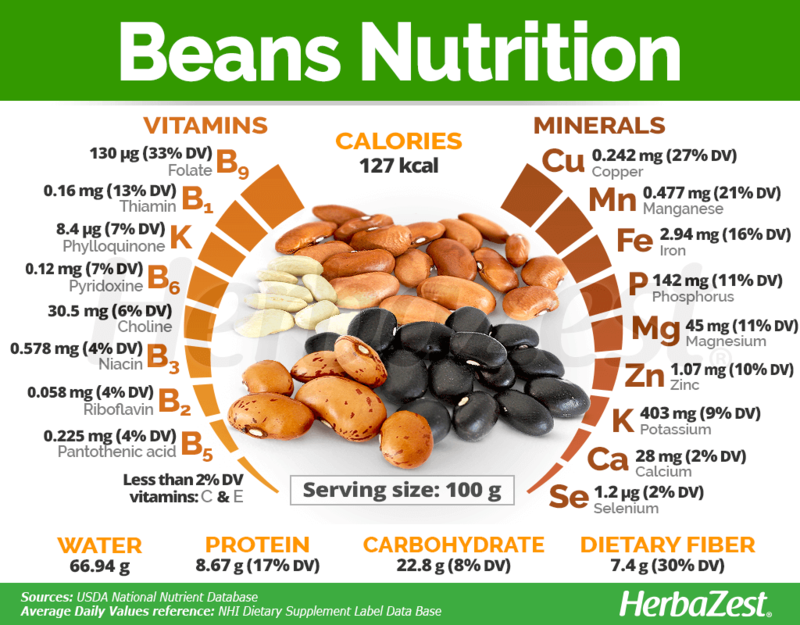 100 grams of cooked beans provide 127 calories, as well as 17% and 30% of daily value for protein and fiber, respectively. Given beans' popular use in modern cooking, it is easy to incorporate beans into everyday culinary practices. Versatile, substantial, and easily seasoned to taste, beans can be added to just about any meal recipe. Beans offer a pleasant taste and interesting texture, while also providing ample nutrients - including a significant amount of protein. Beans constitute a major ingredient in Latin American, Mediterranean, and Asian cuisine and are popular in tropical regions worldwide. Raw. Some varieties of beans, such as green beans, are safe to be consumed raw in fresh dishes like salads. Cooked. Dried beans must be soaked overnightbefore being boiled until they are soft and safe enough to eat. Once cooked, they can be used in salads, stews, and even sweet recipes. Infusions. This legume is included in many teas intended to promote kidney and bladder health, including treating urinary tract infections. Liquid extract. Phaseolus vulgaris extract, made from white kidney beans, is believed to help with weight loss by inhibiting digestion and absorption of carbohydrates. Capsules. Kidney bean supplements are used for weight loss, but substantial evidence of their efficacy has not yet surfaced. Beans are incredibly popular around the world, so they are widely available at grocery stores and natural food stores. Bean plants can be found at most nurseries or through online retailers. Immature bean pods can be bought fresh, frozen, or canned. Beans are also available dried, and bean leaves can even be found in tea form. 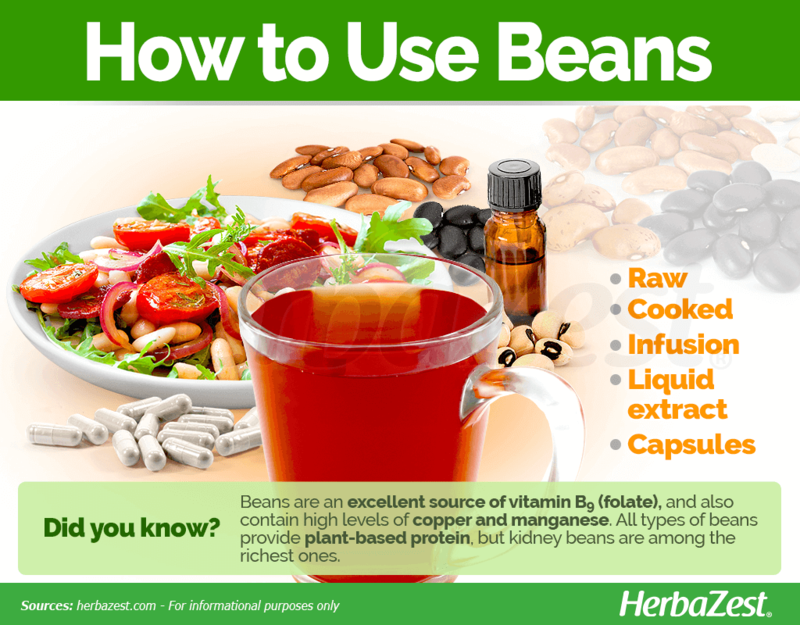 Bean supplements, such as capsules and liquid extracts, are available online and at specialized health stores. However, since the concentration of active compounds in supplements vary depending on the brand, care should be taken in reading the labels and always choose products with reliable certifications. Beans and their relatives are the only cultivated plants that actually enrich the soil rather than deplete it. Since beans cultivation occurs all over the world, there are many varieties, each one with particular characteristics and adapted to thrive in different conditions. One thing they have in common is that, with some care and dedication, they are very easy to grow in a garden or back yard. Beans are annual plants that grow well in both temperate or tropical regions, with full sun. The hardiness of beans depends on the cultivated species. Kidney beans' ideal temperature range is 57 - 79°F (14 - 26°C), while lima beans grow well at 61 - 79°F (16 - 26°C); runner beans are the hardiest ones, and do great at temperatures of 54 - 72°F (12 - 22°C), while tepary beans thrive in warmer areas, within a range of temperature of 68 - 90°F (20 - 32°C). They grow best in well-drained, sandy loam, silt loam or clay loam soils with a pH of 6.0 - 6.8. Bean pods require about an inch (25 mm) of water per week. It is advised not to water the foliage, since this can encourage disease formation. Also, water early in the day. It is recommended to plant beans in the early spring after the last frost when the soil has warmed. Beans are propagated by seed. Indoors germination is not recommended because they don't grow well after being transplanted. Plant beans directly in garden soil or raised beds, one inch (2.5 cm) deep and about two inches (5 cm) apart. Rows should be 18 - 36 inches (46 - 91 cm) apart. In the case of cultivating climbing types of beans, trainers are required for proper growth. Some common bean pests include aphids, Mexican bean beetles, and spider mites. Common diseases include bacterial blights, mosaic virus, and white mold. While bean plants are growing, it is important to remove weeds regularly and strip away old leaves. More detailed information about growing beans can be found in the herb garden section. What's the Difference between Soluble and Insoluble Fiber? Bean plants are characterized by their slender-stemmed climbing vines and narrow, oblong multi-seeded pods. Bean plants have oval leaves and small white or pink flowers, and they can grow up to 12 feet (4 m) tall. Seeds in bean pods are kidney shaped, and they come in various sizes and colors. Beans are members of the legume or Fabaceae family, which comprises 700 genera and about 17,000 species, including economically important crops such as alfalfa (Medicago sativa), chickpeas (Cicer arietinum), fenugreek (Trigonella foenum-graecum), soy (Glycine max), and tamarind (Tamarindus Indica). The common bean, or Phaseolus vulgaris, belongs to the genus Phaseolus, which comprises over 35 species. The most important domesticated species of the genus Phaselous, are P. vulgaris or kidney bean, P. lunatus or lima bean, P. coccineus or runner bean, and P. acutifolius or tepary bean. Currently, beans can be found in countless varieties and hundreds of specialized cultivars, created mainly through selective breeding in order to produce beans of a specific color, size, shape, or starch content. Cultivars are differentiated by their ability to climb and their number of nods, which are capable to fix nitrogen, a peculiarity of all beans that is highly beneficial for the soil. Among the climbers, some popular cultivars are 'Pompadour', 'Canario', and 'ICA Tui'; while 'Aysekadin', 'Rioco', and 'Ecuador 299' are within the shrubby types. Beans first came into cultivation about 7,000 years ago and have long been highly valued for their nourishment value as well as their healing qualities. According to folklore, beans were considered one of the "three sisters" of traditional agricultural cropping methods used by Native Americans, who inter-cropped maize, squash, and beans to reap the most of each plant's benefits. Beans originated in South America and are now cultivated all over the world. Research indicates that beans were first domesticated in two places: the Andean regions of Peru and the Lerma-Santiago basin of Mexico. Presently, common varieties of beans grow in the wild throughout temperate regions. In 2011, over 23 million metric tons of dry beans were harvested worldwide. The leading countries producing dry beans are China, India, Myanmar, and Brazil. Since different varieties of beans have acquired symbol status for different regional cuisines, the canning industry is developing a significant stake in pre-cooked seasoned beans. In addition, 2016 was declared the International Year of Pulses, according to the Food and Agriculture Organization of the United Nations (FAO). It was intended to raise awareness about health benefits of various dried beans and peas to boost their production and trade. Dry leaves, threshed pods, and stalks of various bean plants are also used as fodder for livestock or as fuel in cooking. There is much more to beans than their distinguishable flavor when added to dishes. These vegetables help regulate bowel movements, control blood sugar levels, and enhance ocular health with each bite. The hundreds of varieties available make for endless options in the kitchen, making the possibilities only limited by one's creativity. Handbook of Energy Crops, Phaseolus vulgaris L.